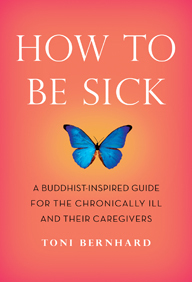 In books, chronic illness Tagged books, chronic illness Bookmark the permalink. I got a bit bogged down in all of the lists and practices, but it might be useful to reread the first few chapters. I think it is very humbling not to be able to do what you want when you want as much as you want. We used to be able to do that as cdrilehn and now I find each stage of life brings me new adjustments. And some of my illnesses like fibromylgia and degenerative disc disease have limited me before my time learning to accept the things you cannot change and listen to your body can be a hard lesson to learn at times but well worth it when you finally do. I find if I can focus more on what I CAN do than what I can’t then I listen better! Blessings to you. Thanks for your prayers and friendship. You are in my prayers as well.